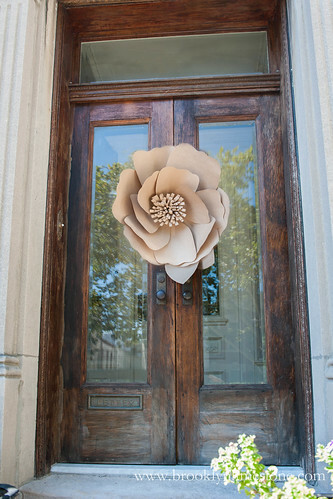 One of the more fun, easy and cheap ways to add some temporary decoration to a door, party or backdrop are some huge paper flowers. They are super simple to make. This is one I threw together using the various techniques I've seen in the past. It doesn't quite represent any particular flower. If you have your heart set on something more specific just do a search and you'll find all kinds of great variations on the theme. Here is my version in 3 different sizes. What you'll need: Sturdy paper (I'm using a roll of construction kraft paper but any kind of large, heavyweight paper will work), scissors, stapler, glue. Cut: Freehand cut 12 petal shapes (6 large and 6 slightly smaller), 2 leaf shapes and one long rectangular piece to fold over and cut fringe style. Cut a slit in the bottom of your petals and leaves. Make: Overlap the slit pieces slightly to form each petal piece into a concave shape and staple together. Overlap the petals to form the flower shape, stapling as you go. Once you can no longer reach the center of the flower with the stapler, use glue instead. You will make 2 flower shapes - one large with the large petals and one small with the small petals. Glue together. Roll your fringed rectangular piece into a circle and adhere to the center with glue. Allow to completely dry before hanging. That's it! 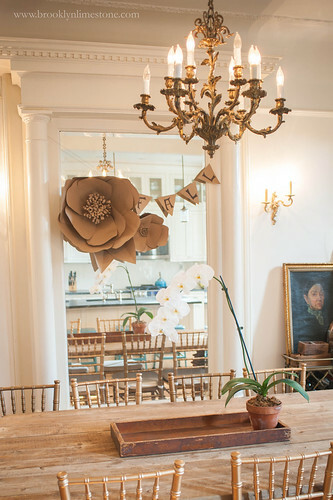 You can vary the size easily simply by using larger or smaller petals. Try different papers for a different texture. Or make lots of them for a whole paper flower garden! Love this. You know I love paper crafts and I'm thinking I may do a twist on this one for our home. <3 Great project that's easy and simple!! These are so pretty! I have made tissue paper ones, but now need to try this. Thanks so much for the tutorial! I will try this with our craft group! Beautiful! I love paper flowers. I made a wreath using old music sheets & just the outer petals of a paper flower pattern. It's fun taking parts of patterns to make your own design like you have here.